Now someone, please, have a girl! Pattern: Based on my honeymoon blanket. The miters were worked over 65 stitches. Yarn: Katia Bombay, 100% cotton, color #2005, 251 yards/skein, 4 skeins. Each skein produced 6 mitered squares. For the edging I used 1 skein of elann	Lara, 100% cotton, color 336 “Purple Heart,” 138 yards/skein. Needles: INOX Express 24″ circs, US 4. For the edging I used a super-long (60″) KnitPicks nickel-plated interchangeable needle, US 4. Finished size: about 27″ wide and 40″ long. When I picked out the yarn for this blanket, I really hoped that it would somehow work for a baby boy or a baby girl. Once I started knitting, it became clear that lilac and magenta dominated the colorway, and there was no way the blanket would work for a wee lad. So, I sighed deeply, lamented the fact that all my friends are expecting boys, and sealed the deal with a bright eggplant-purple border. The blanket assembly was totally unexpected. I couldn’t replicate the way I put the honeymoon blanket together because this version is rectangular, and the honeymoon one was square. But I didn’t follow the 6-piece modified plan, either. As you remember, it would involve some frogging. Boo! Tres Chic Veronique left a comment which implied a much better solution: “I love the zigzags in the first picture!” I’m not sure why I hadn’t seen them before. I think I was too fixated on the individual miters to notice how they flowed together. And I agreed that the zigzags looked great! Plus, to get those, I wouldn’t have to frog or do a thing! 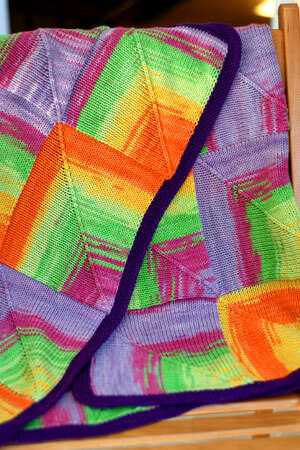 The zigzags emerge naturally as the yarn is knit up! 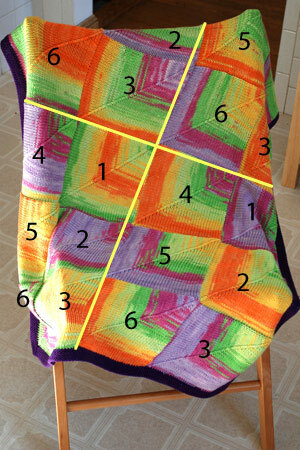 To have continuous zigzags, I would need to seam up my four rectangles all facing the same direction, as though they were knit as one large piece. For the sake of posterity, here’s an assembly diagram. One day it will come in handy, I’m sure :). So, Bombay’s predictable color changes actually ended up being a blessing in disguise! My other groan about this yarn – the puckering near the tips of the miters – was significantly lessened after a trip through the washer and dryer. The yarn blocked very nicely. The stitches bloomed and became more even, the fabric became more drapey, and the puckers eased into the stitches surrounding them. It’s not perfec – one of the long edges of the rectangle is about 2″ shorter than the other – but it’s totally presentable. Whew! Honestly, before I washed it, I didn’t think it was going to be gift-worthy. Much better now :). As before, I tried to cut my working yarn as few times as possible, and wove in ends as I went along. So, even though this is a blanket composed of many smaller pieces, I think the wrong side of the work looks quite nice! I’m still a little peeved about the finished size – 27″ X 40″ – compared to the 31.5″ square of the Jamaica version. But Bombay has its pluses – less splitty, more interesting colorways (in my opinion), and not yet discontinued! Despite various bumps and hurdles, I continue to enjoy knitting these mitered square blankets. I know this won’t be the last one! it’s a fantastic blanket and miters are so fun. kind of wish i had done the blanket i’m working on like this. oh well. i’m not frogging. I love this! It almost makes me wish I was pregnant! Almost. I think it’s a great “colorway” for a baby boy. And like barb says a baby blanket is really for the parents, no? On the other hand, I’ve always thought lavender was a lovely color on men. That is a great blanket! I think a wee lad or lass would LOVE it just the same. Totally gift worthy- I love the zigs and zags, and colour interplay. Great! I love the blanket! I can’t help but be a little disappointed with your adherence to gender stereotypes, however — we’re way past that stage. I love it. The colourway is beautifully brillant, and I like the ‘wrong’ side as much as the ‘right’ side, which is great when used for a baby, so the parent doesn’t need to be too fussy. It will be interesting to see what others do with the same colourway – I have a feeling yours will come out tops. I wouldn’t have thought the colours gender specific, it looks like a bright blanket to me. I love it! 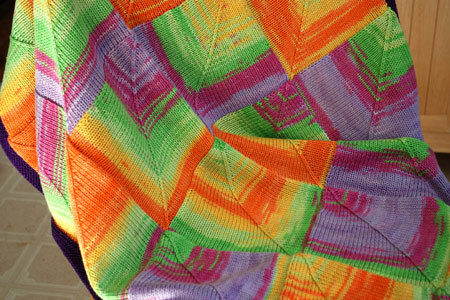 The colors are so cheerful, and the zig zag look really works. Lovely, truly lovely. Do I gather from your notes about this project that for each set of six squares, you didn’t make individual squares (cutting the yarn in between squares), but instead picked up and knit from the edge of the just-completed one? I really do love this blanket. Nicely done! 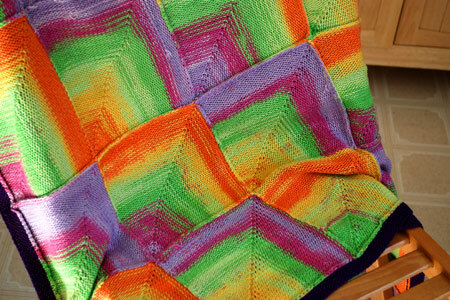 What a bright, snappy-looking blanket! I’m sure any baby – boy or girl – would be attracted by the bright cheery colors. Love it! I already stole your idea to knit a (somewhat more restrained) throw for the couch. I would say that any of my sons would have adored that blanket when they were small, but it turned out later they are all (literally) colorblind… So I don’t really know what most boys like, but *I* sure like those colors! I have to say, that this seems ideal for either a girl or a boy. It is happy, colorful, and would brighten up any child’s room. Delurking to say that I’m having a girl :)Although, even if i was having a boy I would wrap him in such a lovely blanket in a heartbeat. Little babies don’t care if things are pink or blue, they just like to be cuddley. Hmmm, I dunno, I think it would be fine for a boy! When I look at the pictures, I see more orange and yellow than purple/fuschia. I think it would be a great blanket for a baby boy. I know that my 6 year old son would love it and his favorite things are knights and star wars. It’s funny to me the orange and green are MUCH stronger than the magenta and lilac. Bright colors are happy colors for babies. Hey, glad someone knows all people having boys. I am expecting a girl and so is everyone I know who is pregnant or had a baby recently! Beautiful blanket. I would use it for a boy in a heartbeat. It’s lovely and purple is one of my sons’ favorite colors. Oh it’s so pretty! 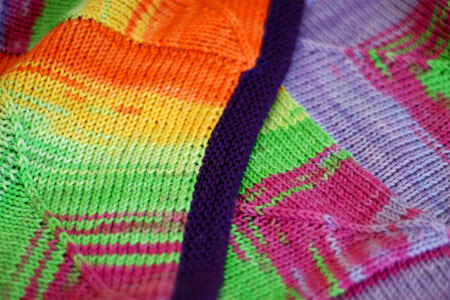 I love that outer edging; it grounds the pattern and makes it easier to see the directions of the patterns in the yarn. So cute! This is just so lovely – the yarn dictates what it wants to be and you make it work. Great job. I’m really not sure why this wouldn’t make a perfectly fine blanket for a boy. But then again, I have no problems letting my boy play with dolls or having a pink car seat. I really like the way the finished blanket turned out. Lot’s of great visual interest. Absolutely gorgeous for boy or girl. Would brighten up any winter baby’s buggy, and encourage exploration at “tummy time”! Babies just love colour and pattern and this is beautifully bountiful with both. Inspiring work – bravo. LOVE IT!! And would work perfectly well for a little boy. Love the orange and yellow with that border. Very cute and oh so fun! Whomever is the lucky friend to have that first girl will be so blessed to have such a wonderful friend. Not to be a total dork but the color works for me. I have an 11-year-old son that loves the colors. I’m pretty sensitive to color issues for boys but I don’t find the magenta girly at all. I’m with a lot of people in thinking that the blanket isn’t girly looking. Maybe the lilac and the magenta were more obvious before the border, but to me the orange is a stand out color there. Either way, it will be much loved! I loved it in progress and I love it now! It’s so refreshing to see baby things that are NOT pastel pink or blue. But my first thought was, oh what a cute blanket for a boy! I’ve been working on some baby boy gifts so maybe that’s just where my mind is right now. Wow! I love the pop of those colors, especially with the eggplant purple border. Great job! I agree w/ everybody who said this is a gender neutral blanket. Totally. Can you tell me how you did the miters? I’ve made some blankets doing the squares a la Mason Dixon but I like the way that center line looks here better than mine. Also, how many stitches do you cast on to start these squares? I’ve got some yarn that’s dying to be one of these blankets. Mitered square blankets are so addictive!! I love the blanket – both sides – the purl side looks so neat and lovely. And as others have already said, I would absolutely use this for a boy. I don’t know what you’re seeing, this doesn’t scream “girly” to me at all. I would totally use this for a boy! Very nice. This is so pretty. It makes me want to go knit one up right away. Why encourage gender stereotypes? Any mom worth her salt would be pleased and excited to get a beautiful hand knit baby blanket, colors be damned! I’d totally use that for a baby boy! It’s amazing! beautiful colors! I love what you did with it. Wow, it is really wonderful! This is a lovely blanket and I totally think that this works well for both boys and girls. It’s bad enough that the fashion industry constantly encourages gender stereotypes with their choices of color and style. As knitters we can be so much flexible especially when it comes to colors. Personally I totally refuse to go with the pink/baby blue stereotype when knitting for babies and kids. Well, I totally disagree with you. Violet/lilac is from my point of view also ideal for boys. Since when did lilac become a girl colour? Plus, there’s lot of orange and green too. 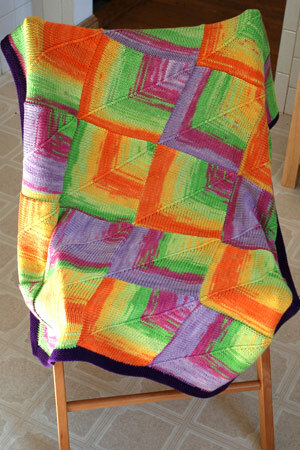 The colours are simply cheerful and the blanket is beautiful. I say: give it to a boy and break the silly colour rule. This blanket is wonderful! What a precious gift for any child. Could you talk a little bit about how you created the border? Did you knit all four sides separately and then stitch the ends together? Or were you able to knit all the way around?